Memorial services for Linda may Edwards of Baudette, MN will be held on Friday, September 7, 2018 at 3 PM at the Evangelical Covenant Church in Baudette. Visitation will be on hour prior at the church. Interment will be at the St. Clement's Cemetery in Massey, MD. In lieu of flowers, memorial are preferred. 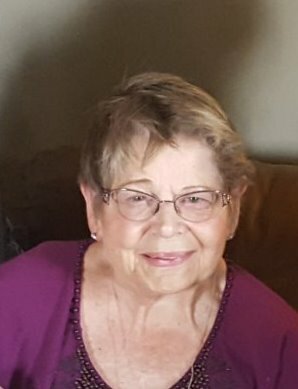 Linda May Edwards passed away on September 2, 2018 at her home in Baudette, MN at the age of 73. Linda was born on June 19, 1945 in Phoenixville, PA to Mazie (Beitler) and Allan Stover. She moved to Elkton, MD as a young girl and attended school there. She and Charles Edwards were united in marriage on October 13, 1962. She stayed at home to raise her young children, until moving to Baudette, MN in 1977. She worked for 29 years for Marvin Windows and Doors until she retired in 2006 due to health concerns. Linda enjoyed knitting, quilting, gardening and baking. She took pleasure in working side by side with her husband in building a home by hand. She volunteered in boy scouts, girl scouts and 4-H. She loved to spend time with her children and grandchildren. She will be remembered as a hard-worker; and for her kindness and perseverance through the challenges in her life. She is survived by her husband, Charlie of Baudette; four children, Charlie Edwards of Baudette, Sherry (Rich) Kroska of Wyoming, MN, Rodney (Lanier) Edwards of Baudette and Hannah (Steve) Hedeen of Vasa, MN; 11 grandchildren, Jake, Bryan, Linda, Luke, Sarah, Asher, Mazie, Andrew, Micah, Ezra, Jubal; great-grandchildren, Spencer and Owen and brothers, Martin Stover of Pennsylvania and Ron Stover of Maryland. She was preceded in death by her parents; stillborn daughter, Amanda; and daughter-in-law, Becky.